What makes a great brand? At SPM we believe that a great brand is one that knows its promise and strives to keep it in all they do. You don’t need to be a huge brand with a product or service offered to millions, you just need to matter to your ideal customers. Before we dive into the 6 tips that you can implement to create brand consistency, let’s warm up with a quiz! The reason that these companies have created this space in your mind as a recognizable brand is because they have mastered the six tips that will be discussed shortly. The best part is, you don’t need to be a billion dollar company to make yourself memorable to your ideal customers! You just need to be consistent with these six tips below. What are the key messages that you want to communicate about your brand? Your brand message should be directed toward your ideal customer. Your goal should not be to be all things to everyone, instead your goal should be to direct your messaging toward your key audience. What matters to that ideal customer and how does your brand ease their pain points, bring them joy and make their dreams come true? Articulate that message. Then be sure that everyone within your organization is on board with your brand message. You can’t expect your potential customers to love and engage with your brand if your own employees don’t. Integrating your brand starts with the mission and vision and continues into every single piece of your business. From the language you use to talk about your business, the design of your website, logo, the vibe in the office, the way you answer phones and interact with customers, print pieces, social media, and the ethics you stand for and promises you make your clients. Every piece of your business should be in tune with your brand. Can you think of some global or even local brands that do a great job of integrating their brand in everything they do? Your brand should have a look and feel across all of your marketing that allows people to identify and build a brand awareness when they engage with you. Whether it’s social media, TV, print or other, the overall look and feel should be consistent across all channels. Think about if you’ve ever received an email, packaging or mail piece and with just a glance you recognized who it was from. I notice this in my social news feed as I’m scanning through content. There are a few brands who pop out to me with the colors and design of their social media posts and I know who they are without even reading the whole post, that’s what it means to create a consistent brand look and feel. Your brand voice should be used in written communications that allows people to become more familiar with your brand in the way things are written. Both the look, feel + voice play an important part in the relationship that is developed between your brand + prospective customers. Just think, has a catchy post ever caught your eye on social media, or have you ever read a witty email marketing piece that hit the right spot? That company’s brand voice was speaking to you and building a connection. Being true to your brand means delivering on your brand promise. The way to build trust with customers is to make that promise and then deliver on it, every time. Be true. Now that we’ve covered 6 key tips to brand consistency, let’s test yours skills and see if you can identify some markers for a few of the world’s most widely recognized brands! What are a few words/phrases you think of to describe these Global brands? Disney: Did you think of Magic? Magical experiences, Pleasing Customers, Putting smiles on children’s phases, making lasting memories, dreams come true. Toyota has successfully developed two distinct brands with their own voice, feel, messaging and promise. I interacted with them on what I would consider a very small order (under $100) and I was pleasantly surprised to find that they were able to save me money on the items I wanted, all while being able to work with a local company. The process of working with them was SOOOO EZ! As a customer you can call, email your request or sign in to theironline ordering system. In my case, they had a mock up back to me within 24 hours. This greatly improved the efficiency of the process because I didn’t have to go online to create a mock-up and I didn’t have to find a graphic designer to help me. They mocked up what I wanted and emailed it over for my approval. They even made 2 rounds of edits at no-charge! Brand promise to increase efficiency by using EZOP: Check. Getting back to the large or small part, I am a small local business and I had contacted EZOP for a very small order however, they made me feel like my order truly mattered, just as they say “large or small.” The office staff who I communicated with provided top notch customer service and made me feel like my small business and my small order truly mattered. Being true to their brand: Check. Community Involvement: you can see EZOP involved all over the Madison community as sponsors of business and charitable events and with their owners and staff serving on area boards. Integrating the brand in all they do: Check. 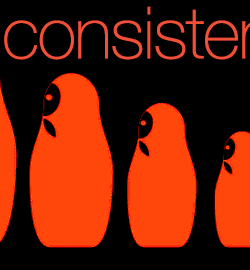 I hope that this post about Six Tips to Create Brand Consistency has been an inspiring and useful guide as you seek to create consistency for your local business. Developing your brand is no over-night task. As a start-up business in our first year, we are actively working toward this consistency as well. By taking a time out every so often you will allow yourself the chance to review where you started, where you are and where you want to go, and creating consistency within your brand is an integral part of that business plan. 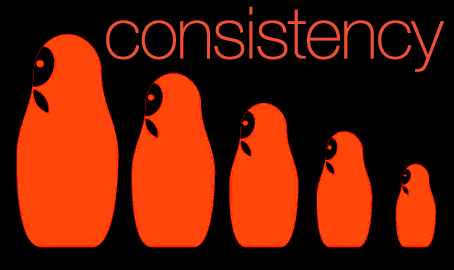 Let us know, what are some of your favorite brands who exemplify brand consistency? Join in the conversation by commenting on this post!